Looking for honeymoon suites in the Poconos? Rest assured you've come to the right place! For decades, Hideaway Hills has been providing couples worldwide with a complete modern bridal facility, making us your preferred choice when it comes to honeymoon suites in the Pocono Mountains. The magic doesn't stop once the last couple leaves the dance floor, it only begins! Newlyweds can enjoy their first night together in our sensational honeymoon suite. 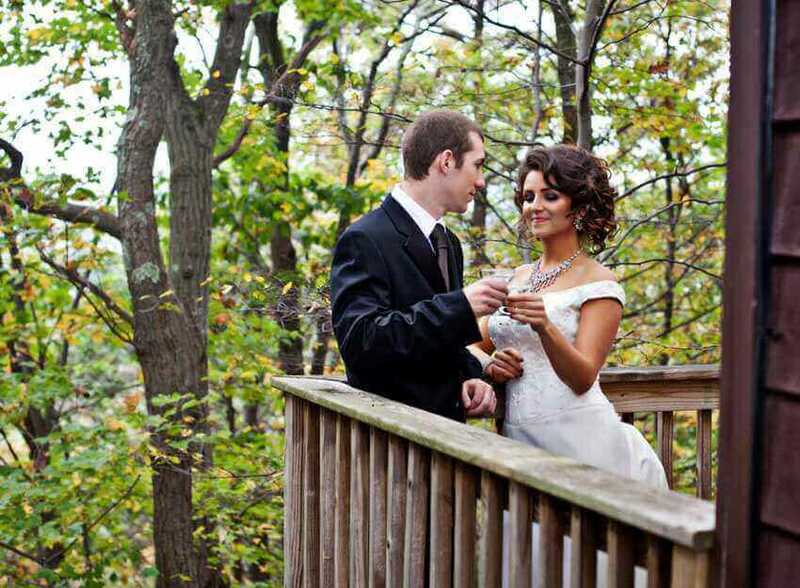 Showcasing a balcony with breathtaking views, a cozy fireplace and state-of-the-art Jacuzzi, our luxurious Poconos honeymoon suite is the perfect end to the most romantic day of your lives as newlyweds. Want to set up a tour with one of our experienced wedding planners? There’s no better place in the Poconos for a venue than Hideaway Hills! Call (610) 681-6000 today! WHAT KIND OF WEDDING DO YOU HAVE IN MIND? Joe Farda of Hideaway Hills was excellent to work with. We were looking for a venue that could accommodate up to 200 people. We toured the facility and were very pleased with what we saw and promptly booked the venue. An outdoor wedding ceremony was planned and the courtyard setting was beautiful. The cost per person was very reasonable and includes a wide selection of hot and cold appetizers and entrÃ©e options as well as the wedding cake of your choice. The food was absolutely fabulous. They catered to our every need. I would recommend Hideaway Hills to anyone looking for a beautiful venue that is reasonably priced. Awesome work by staff and management! My Husband and I used this venue for our ceremony and reception; we also used it for our rehearsal dinner the night before the wedding. Joe and all of his staff were very professional and extremely helpful. Joe gave us a list of recommended vendors; we went with his suggestions for our DJ services, cake and flowers. All of said vendors were very helpful, professional, and budget friendly. The vendors were local; which made them very accessible pre-wedding. The food was amazing! Our guests still rave about it. The menu is very flexible; which allowed the staff to accommodate our guests with food allergies. The venue it's self is very picturesque. Our photographer loved the backdrops. The Bridal Sweet did the job *wink wink*. And the guest cabins are affordable. Overall Hideaway Hills was the best choice for our wedding, and we are very happy to have had it there. We had our wedding at Hideaway Hills in October of 2013. I cannot say enough about this place and the people! We had over 120 guests, young and old, some traveling from Thailand, England, Washington D.C., San Francisco, and more! Everyone was highly impressed with the gorgeous, private setting of the venue. Hideaway Hills is a true gem. It is beautifully vintage and charmingly intimate. The Hideaway staff provided everything we could have imagined for our wedding weekend (and all for an extremely reasonable price). From the rehearsal dinner, to the Grooms golf outing, the ceremony, the reception, and the brunch on Sunday morning - everything was simply stunning and stress free. The food is wonderful, the landscape is breath taking, and the atmosphere is incredible - But above all, the staff and the people at Hideaway Hills are truly phenomenal. They worked so hard to make our wedding so memorable and special. The great advantage of having your wedding at Hideaway Hills, a family owned business, is that they truly care. They made our dream wedding into a reality. We are in the process of planning another event for all of our family and friends at this venue! Can't wait to go back! 5590 Carney Road, Kresgeville, PA 18333.